One of the few US pilots to have spent the whole of his World War II flying career wearing a British RAF uniform, Parke Smith from Richmond Virginia volunteered to join the RAF in 1942 and went on to serve with distinction in three operational RAF squadrons ~ 253 Squadron (Africa 1943); 225 Squadron (Italy 1943/44) and 65 Squadron (UK 1944/45) ~ flying Spitfires, Hurricanes and Mustangs in a variety of roles. 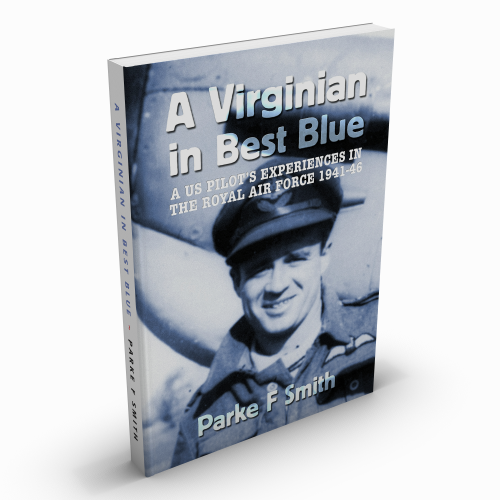 Coming from the USA, Parke found Britain and the British to be full of surprises and his entertaining book presents an enlightening outsider's perspective on many aspects of wartime life in the RAF and the UK in general as well as recording his varied and eventful flying experiences. "It has been my good fortune to have known many great men and women of our time and to have had entree to places and incidents that but for a lifetime of aviation, might not have been possible. In all that time, those I have admired the most have usually been quiet, modest individuals who seek neither fame nor fortune. They have their own code of conduct and behaviour. Parke, in my opinion, is a prime example and his reward has been the respect of his friends and the love, pride and admiration of his family." Powered by ShopFactory to sell P144 online. All-in one eCommerce and online shopping cart software.